Climate scientists predict that if carbon dioxide levels continue to increase, the planet will become warmer in the next century. Projected temperature increases will most likely result in a variety of impacts. In coastal areas, sea-level rise due to the warming of the oceans and the melting of glaciers may lead to the inundation of wetlands, river deltas, and even populated areas. Altered weather patterns may result in more extreme weather events. And inland agricultural zones could suffer an increase in the frequency of droughts. Between 1982 and 2011 20.5% of the world's vegetated area got greener while just 3% got browner. The claim that I specifically want to question is this: he claims that recent research as shown that the world is, literally, getting greener. The cause of this is increased forestation, higher rates of growth of plants and the rolling back of desert areas such as the Sahel in Africa. These changes can be traced to two effects: more rainfall and higher carbon dioxide levels. Both are good for plants and both are a consequence of the human production of carbon dioxide (rainfall increases in a warmer world through more evaporation). His claim is based on work by Professor Ranga Myneni at Boston University whose work can be found here. 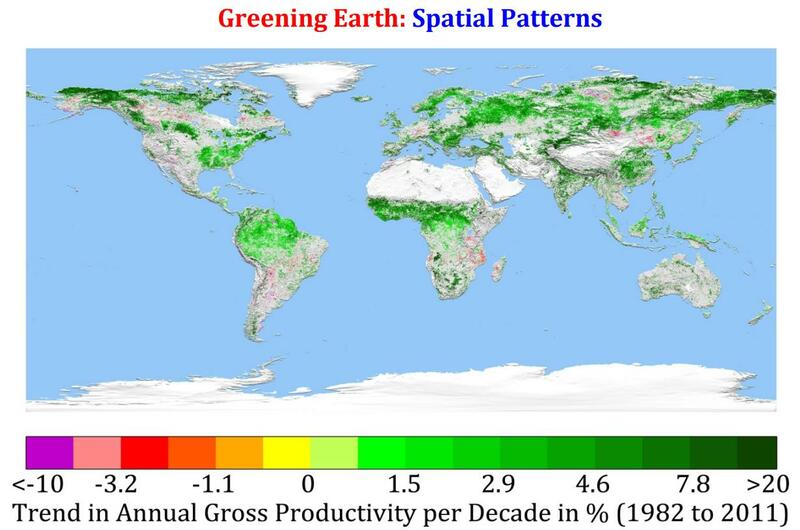 Is the world getting greener? Is the effect a consequence of higher carbon dioxide levels and the knock-on effects of global warming? Your answer is pretty much entirely contained in the IPCC's Fourth Assesment Report, section 1.3.6.2 (Forestry), except for the part about the Sahel in Africa. It's pretty short and concise, so I recommend reading it for yourself. Thus, the overall trend towards longer growing seasons is consistent with an increase in the ‘greenness’ of vegetation, for broadly continuous regions in Eurasia and in a more fragmented way in North America, reflecting changes in biological activity. However, in the humid evergreen tropical forest in Costa Rica, annual growth from 1984 to 2000 was shown to vary inversely with the annual mean of daily minimum temperature, because of increased respiration at night (Clark et al., 2003). For southern Europe, a trend towards a reduction in biomass production has been detected in relation to rainfall decrease (Maselli, 2004), especially after the severe drought of 2003 (Gobron et al., 2005; Lobo and Maisongrande, 2006). A recent study in the mountains of north-east Spain (Jump et al., 2006) shows significantly lower growth of mature beech trees at the lower limit of this species compared with those at higher altitudes. For North America, recent observations from satellite imagery (for the period 1982 to 2003) document a decline for a substantial portion of northern forest, possibly related to warmer and longer summers, whereas tundra productivity is continuing to increase (Goetz et al., 2005). They also confirm other results about the effects of droughts (Lotsch et al., 2005), as well those made by ground measurements (D’Arrigo et al., 2004; Wilmking et al., 2004). Thus: yes, the world is overall getting greener by a couple of tens of percents. This seems to be largely because areas of Eurasia and North America (which remember, includes Canada - they're not just the USA's silly hat) that were previously very cold are now getting warmer. However, despite this overall "greening", some areas of the world (and particularly, areas that humans like living in) seem to be experiencing a reduction in biomass. This is where your quote from the Union of Concerned Scientists comes in - they're worried that the areas people actually farm in will become less productive due to global warming, and an overall increase in net primary productivity due to an Eurasian bloom doesn't exactly assuage that fear. If you want more information as to why they would be okay signing on to that quote, section 1.3.6.1 (Crops and livestock) more directly addresses it. Yes, the world is literally getting greener, largely thanks to anthropogenically-elevated atmospheric CO2 levels. Images taken between 1982 and 2002 revealed extensive regreening throughout the Sahel, according to a new study in the journal Biogeosciences. / The study suggests huge increases in vegetation in areas including central Chad and western Sudan. ... "Before, there was not a single scorpion, not a single blade of grass," he said. "Now you have people grazing their camels in areas which may not have been used for hundreds or even thousands of years. You see birds, ostriches, gazelles coming back, even sorts of amphibians coming back... The trend has continued for more than 20 years. It is indisputable." Why is it getting greener? An effect called the CO2 fertilization effect leads to healthier, faster-growing plants. Higher CO2 levels in the atmosphere cause increased plant growth. A study published in 2013 found that in warm and arid environments over a 28 year period (1982-2010), as CO2 levels increased by 14%, foliage cover increased by 11%. about 15 percent of agricultural yields are due to CO2 we put in the atmosphere. If you look at plant growth rates in response to CO2 enrichment & depletion, that conclusion is inescapable. Yet 15% is really a conservative estimate, a lower bound. The agricultural yield enhancement from anthropogenic CO2 is really at least 15%. Bunce (2012) finds that the widely-used FACE methodology for measuring plant response to elevated CO2 results in an underestimate of the agricultural productivity improvement from higher CO2 levels (as also explained by Prof. George Hendrey). [...] CO2-soaked [birch, aspen & maple] trees grew 26 percent more than those exposed to normal levels of carbon dioxide. CO2 is a more stable, less reactive molecule than O2. Venus and Mars both have atmospheres which consist mostly of CO2, with almost no free oxygen. But on Earth the opposite is true. There are more than 500 times as many O2 molecules in the Earth's atmosphere as CO2 molecules. Why is there so little carbon dioxide, and so much free oxygen, in the Earth's atmosphere? The answer is that Venus & Mars are dead planets, and the Earth is not. Its plants use CO2 and produce O2, and its animals use O2 and produce CO2. In the tug-of-war between plants and animals, the plants won. Plants have tugged the CO2-O2 tug-of-war rope all the way to the end. (Some carbon also ends up sequestered by animals in calcium carbonate shells, etc.) Animals are relatively scarce, compared to photosynthetic plants, and the plants have used up nearly all the CO2. The outnumbered animals just can't produce enough CO2 to keep up. That's why, on Earth, O2 is plentiful, and CO2 is measured in parts-per-million. Higher CO2 levels are very beneficial for agriculture. C3 photosynthesis plants, like wheat, rice, all vegetables, all nuts, and nearly all fruits, benefit the most from additional CO2. But even C4 plants, like corn and sorghum, grow better with higher CO2 levels, especially when under drought stress. Thousands of studies have found that nearly all plants benefit from additional CO2. 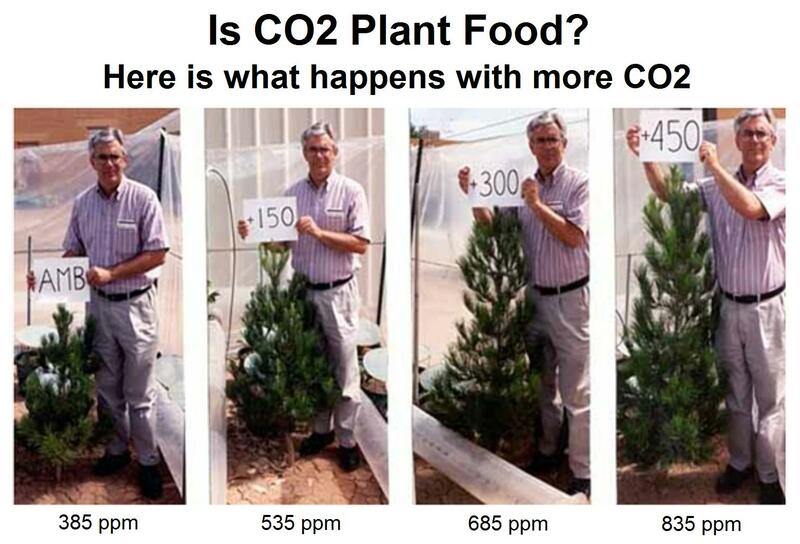 That's why commercial greenhouse operators use CO2 generators to artificially boost the CO2 levels in their greenhouses to 2.5x to 4x normal levels: because higher CO2 levels result in much faster-growing, healthier plants. BTW, I also recommend to you Matt Ridley's 2011 Angus Millar lecture at the RSA, entitled, Scientific Heresy. Not the answer you're looking for? Browse other questions tagged environment climate-change fossil-fuel matt-ridley . Is the world warmer now than during the Medieval Warm Period?